I was thrilled to learn Dr. Villoldo’s diet plan is aligned with the latest evidences of unbiased clinical and experimental researches. After all, his protocol is similar to the ones reputable figures such as Dr. Hyman, Dr. Mercola, Dr. Longo, Dr. Lipman and Dr. Perlmutter recommend. Right in Chapter 1 we get a glimpse of what’s coming ahead—we delve into the details later, in Chapters 5 and 6.Just recently I started studying the synergy between food and spiritual rituals as a one practice. I used to think of them as separate activities. Well, they can be powerful when brought together, creating a deep sense of awareness and gratitude due to their potential to heal from inside out. So why not taking advantage of that while preparing, consuming, and digesting our meals? As I shared above, it’s the first time reading about shamanic practices, but during the last year or so I’ve had the chance to read 2 books that incorporate spiritual practices and rituals around meals. They focus mostly on Buddhist practices involving cooking and eating, whereas Grow a New Body also adds the healing aspect of proper nourishment to the spiritual practice. 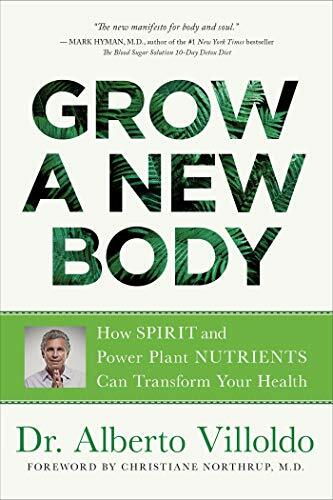 Some of the takeaways I learned throughout the book are:  exploring rituals enrich life experiences,  being open to unknown elements by trusting our instincts is key in life,  being in direct contact with nature in a deeper level is innate to us, and  having simple yet nutritious meals is precisely important for our healing journey.….